This set of Network Theory Questions and Answers for Experienced people focuses on “Voltage and Current Values of a Sine Wave”. 1. Find the instantaneous value of the sine value at 90⁰ point having an amplitude 10V and time period 360⁰. Explanation: The equation for sine wave A is v(t) = 10sinωt. The value at 90⁰ in this wave is v (t) = 10sin90⁰ = 10V. 2. Find the instantaneous value at 90⁰ point of the sine wave if the wave is shifted by 45⁰. Explanation: The equation for sine wave A is v(t) = 10sinωt. The equation for sine wave A is v(t) = 8sin(ωt-π/4). ωt = π/2. v (t) = 8sin(π/2-π/4) = 8sin45⁰=8(0.707) = 5.66V. 3. The value of the sine wave at some particular instant is called? Explanation: The value of the sine wave at some particular instant is called instantaneous value. This value is different at different points along the waveform. 4. The maximum value of the wave during positive half cycle or maximum value of the wave during negative cycle is called? Explanation: The maximum value of the wave during positive half cycle or maximum value of the wave during negative cycle is called peak value. Since the values of these two are equal in magnitude, a sine wave is characterized by a single peak value. 5. The total area under the complete curve divided by the distance of the curve is called? Explanation: The total area under the complete curve divided by the distance of the curve is called average value. The average value of a sine wave over on e complete cycle is always zero. 6. The value from positive to negative peak of the sine wave is called? Explanation: The value from positive to negative peak of the sine wave is called peak to peak value of a sine wave. 7. The RMS value of sine wave is? Explanation: The root mean square value of a sine wave is a measure of the heating effect of the wave. The RMS value of sine wave is 0.707Vp. 8. A wire is carrying a direct current of 20A and a sinusoidal alternating current of peak value 20A. Find the rms value of the resultant current. Explanation: Direct current = 20A, sinusoidal alternating current of peak value = 20A. The rms value of the combined wave=√(202+202/2) =24.5A. 9. The peak factor of the sinusoidal waveform is? Explanation: The peak factor of any waveform is defined as the ratio of the peak value of the wave to the rms value of the wave. Peak factor = Vp/( Vrms) =Vp/(Vp/√2)=√2=1.414. 10. The form factor of the sinusoidal waveform is? Explanation: Form factor of any waveform is defined as the ratio of the rms value to the average value of the wave. Form factor = Vrms/Vav =(Vp/√2)/0.637Vp=1.11. 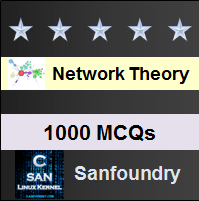 To practice all areas of Network Theory for Experienced people, here is complete set of 1000+ Multiple Choice Questions and Answers.